DocStar is an account payable automation system that offers powerful business process automation tools that help accelerate growth and is available as a cloud-based as well as on-premises solution. The platform works well for a variety of industries, including banking and financial services, legal, healthcare, real-estate, insurance, manufacturing, education and not-for-profits. Features including auto invoice capture, invoice separation, form recognition, OCR, data extraction, invoice matching, one-click batch validation, routing and approval, purchase requisition, custom calculations, customizable reporting and graphical dashboards make it easier for users to manage AP and help increase efficiency and productivity. DocStar AP automation can be integrated with a variety of popular ERPs, allowing organizations to make the most out of their ERP investment and existing accounting systems. From basic to full automation and integration with ERP and accounting systems, DocStar offers a variety of AP automation solutions according to varying business needs. 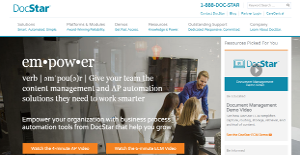 DocStar ECM for AP is suitable for organizations that have less than 1,000 monthly invoices, while DocStar ECM Smart AP suits for organizations that process more than 1,000 invoices monthly. Basic AP automation helps small and medium sized organizations reduce cost and offers powerful tools for managing AP in a better way. The software automatically captures supporting documents and invoices from scans, emails and fax, regardless of the volume. Data capturing and search is made easier by OCR (optical character recognition), barcodes and intelligent data capture. The advanced recognition technology allows separating distinct invoices from import or batch scan and identifies key index fields automatically. The system is designed to automatically learn to recognize invoices coming from vendors, while users can set pre-defined rules to route such invoices. Customizable workflows and invoice matching is made easier by the graphical drag-and-drop workflow designer, allowing stake holders to monitor the progress and receive real-time alerts. Ability to integrate with many popular ERPs and accounting systems ensures seamless data sync between different systems and helps organizations leverage their investments. E-forms allow users to easily capture, attest, approve and integrate data with the core systems, while real-time updates reduce chances of duplicated data-entry and errors. Each company has different requirements and requires an application that can be personalized for their size, kind of staff members and buyers, and the specific industry they are in. For these reasons, no system can offer perfect tools out-of-the-box. When you look for a software product, first be sure what you need it for. Read some DocStar reviews and ask yourself do you want basic features or do you require sophisticated features? Are there any industry-specific features that you are searching for? Get the answers to these queries to aid your search. There are plenty of elements that you need to consider and these include your budget, particular business wants, your organization size, integration needs etc. Take your time, try out a few free trials, and finally choose the platform that provides all that you want to enhance your organization efficiency and productivity. How Much Does DocStar Cost? DocStar’s SMB and enterprise pricing information is available only upon request. Contact the company for more details, and ask for your quote. We realize that when you make a decision to buy Accounts Payable Software it’s important not only to see how experts evaluate it in their reviews, but also to find out if the real people and companies that buy it are actually satisfied with the product. That’s why we’ve created our behavior-based Customer Satisfaction Algorithm™ that gathers customer reviews, comments and DocStar reviews across a wide range of social media sites. The data is then presented in an easy to digest form showing how many people had positive and negative experience with DocStar. With that information at hand you should be equipped to make an informed buying decision that you won’t regret. What are DocStar pricing details? What integrations are available for DocStar? If you need more information about DocStar or you simply have a question let us know what you need and we’ll forward your request directly to the vendor.